Two Wits engineering students and their professor have created a clean energy based system specially designed to meet the needs of South Africans who face electricity shortages. Professor Willie Cronje of the School of Electrical & Information Engineering came up with the idea of the PiCo power system in 2010. Cronje built the first prototype with his students in 2014. The PiCo power system operates through the use of solar panels and additional external batteries to store power for when there is no sunlight. “It was created because we realised that conventional solutions would not be able to address all the rural users in Africa, who still don’t have access to reliable electricity,” Cronje told Wits Vuvuzela. The PiCo power system is “a freely expandable system that can grow according to the needs of a household or user,” he added. 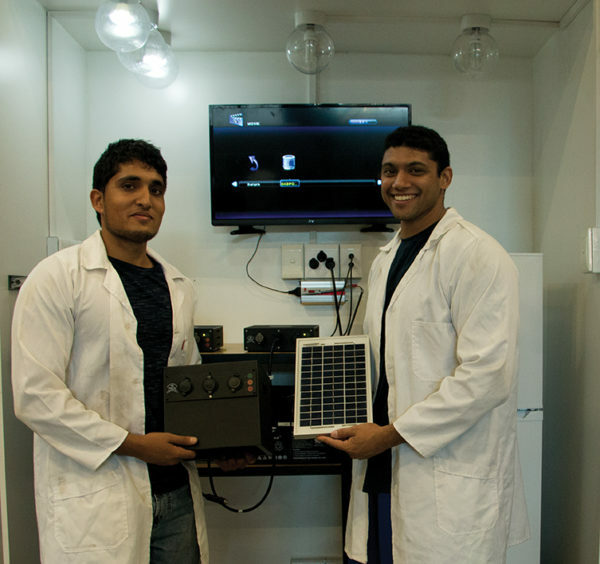 Muhammed Aswat and Raees Dangor developed the idea during their Masters degrees at Wits University. “You get few chances to change the world like this,” Aswat told Wits Vuvuzela. The 26-year-old, who is currently completing a doctorate degree in engineering, said, “The [project] is one stepping stone towards a bigger picture”. Dangor said they wanted to build a solution from Africa for Africa. The 27-year-old added that “this project means everything to me, and it has opened up job opportunities”. The team of engineers have successfully set up the PiCo power system at the Wits Rural Facility, where it is currently operational. They hope to commercialize the PiCo power system project by 2020. Wits Vuvuzela, Wits mining engineering school top of class in university rankings. March 27, 2019. Wits Vuvuzela, Engineering graduate takes to the airwaves. March 20, 2019. Wits Vuvuzela, Wits engineers connect brain to internet. March 17, 2019.